After completing a MS and MPH in International Food Policy and Global Health, and working on global health and environmental issues around the world, one thing became exceptionally clear to me — policy is one of the biggest impacts to either enabling or disabling big business operations that are choosing to put the health and safety of our people and planet at risk. It’s thanks to policy that we have protected conservation land, that we breathe clean air, and still have fish remaining in our seas. Policy allows for young farmers to receive necessary funding needed to protect our soil and grow healthy food for our kids to eat. Policy allows for affordable access to life saving prescription medications, school meals for students, and policy can take it all away. Everything I listed above is at stake in this next election, and so much more, which is why it is so important to get informed, show up, and make your voice heard. 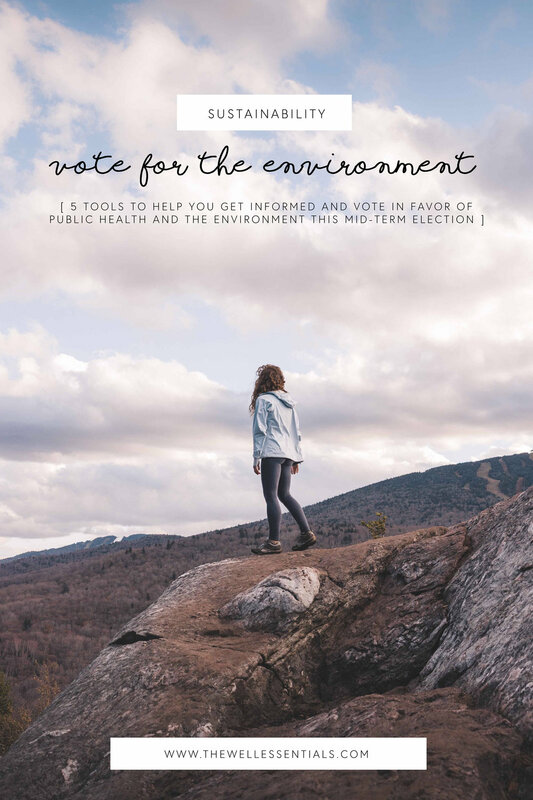 And if you care about public health and the environment here are 5 tools that I think are incredible resources to help make voting in favor of public health and the environment this mid-term election. 2018 Dirty Dozen: Cleverly nicknamed “the dirty dozen” this website lists the “dirtiest” members of our house and senate when it comes to climate change and environmental/public health related issues. This list is important to become educated on as some of these people may be representing your own states and certainly are impacting our nations public policy. Climate Voters Guide: This resource by Vote Climate U.S. PAC allows you to choose your state and then assess how your state representatives have voted on climate related issues. How the scores are determined and ranked in also explained in detail on the website. Simply click on your state or type in your zipcode to get started learning about the climate policies of your states representatives. Next Gen America has a great resource that allows you to search by topic of interest and then makes it easy for you to write/call your local representative with pre-written templates for calling/writing. The Skimm has one of the best cheat sheets for understanding your ballot before you enter the polling box. Simply enter your address and your ballot will pop-up with information on every running politician and law on the ticket. Using these tools to educate yourself can be a great start to confidently voting come election day. However, I would also recommend that you speak to people within your local community that are involved in local issues, especially when it comes to the laws up for vote on your ballot. USA.Gov: Not sure where to register, if you are registered, when to vote, and what to bring with you? This site from USA.gov is a helpful breakdown of everything you need to know about the logistics of voting in your area. Vote.org: Vote.org also has a great resource for quickly finding your local polling area. Click here to find out where to vote in your area. Environmental Voter Project has a great resource for helping you know when elections are happening, get registered to vote, apply for an absentee ballot and much more. Click here to get started. Resist Bot: A free service that will help you quickly communicate and engage with your representatives. Simply text the word congress to Resistbot on Messenger, Twitter, Telegram, or to 50409 on SMS* and it will find out who represents you in Congress, and deliver your message to your two Senators and representative in under 2 minutes. No downloads or apps required. Climate Nexus has an interactive map that allows you to click on your state and learn about climate change related issues that are directly relevant for your state in-particular. Educating yourself on issues that are relevant to your local area can help inform your voting choices come election day. I hope you find these resources helpful and make your voice heard on election day. You matter, your voice matters, so use it.